We're also trying something new this year. It's like a traveling league... with a twist. I want to get a better understanding of where the ladies play in the KC area so we will be coming to a course near you very soon! I also hope this will give better opportunities for more women to participate. New for 2016: Then one night during the week we will offer a 2nd league on a rotating schedule of courses. We will be supporting other KCFDC leagues throughout the year with hopefully 1 or 2 women's cards. Check out the schedule for April below. I'll add to this once we see how this rotation works out for everyone in April. No Olathe dates? We'd love to have the Diva's out! 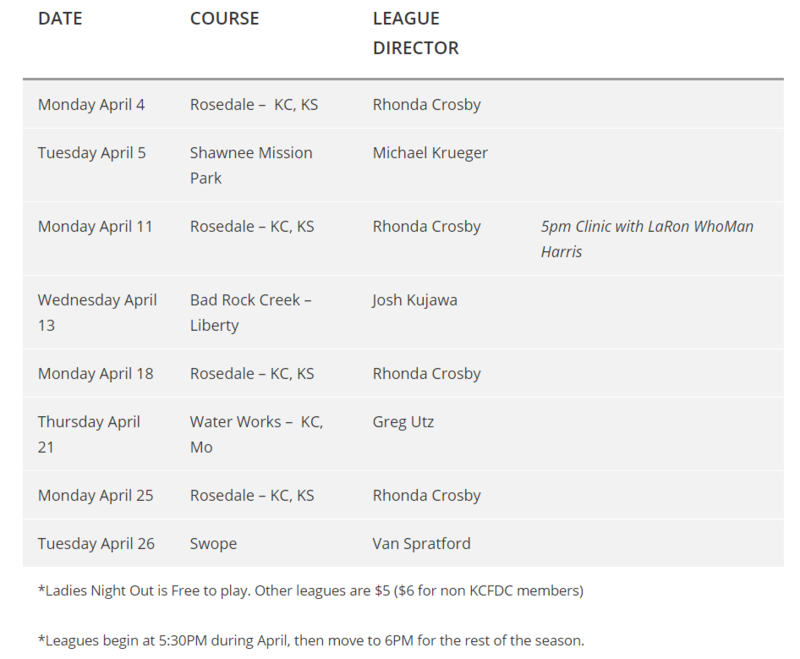 im sure May will have other courses like the olathe courses, cliff drive/big blue, and wilbur young. Rhonda, I really like this idea!